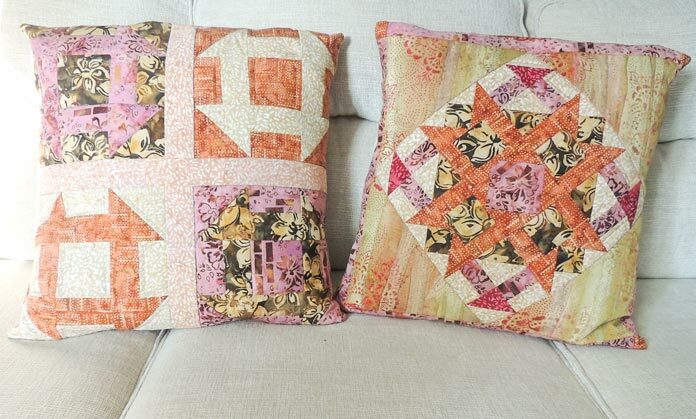 Home » Northcott » 4 quilted churn dash blocks are better than 1! Thanks for joining me for twice the fun this week! The beautiful and new line of fabric, Mary, of Banyan Batiks, is in stores this month! In yesterday’s post, I created churn dash blocks to make a second quilted cushion from the leftover fabrics from the first cushion cover this week. The beauty of the separate batiks was being challenged setting the blocks beside each other so today we’ll add a sashing between them before quilting and creating the cushion cover. 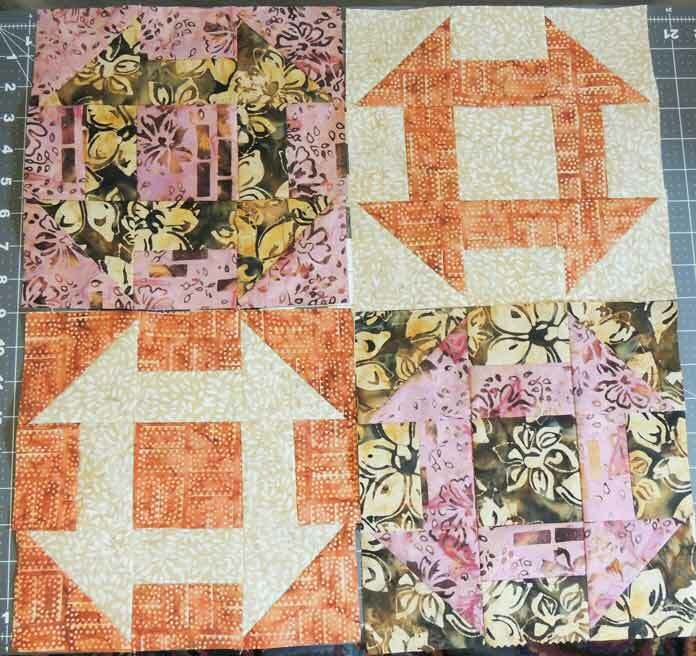 Before we add sashing, make sure each of your churn dash blocks is 9½” square. 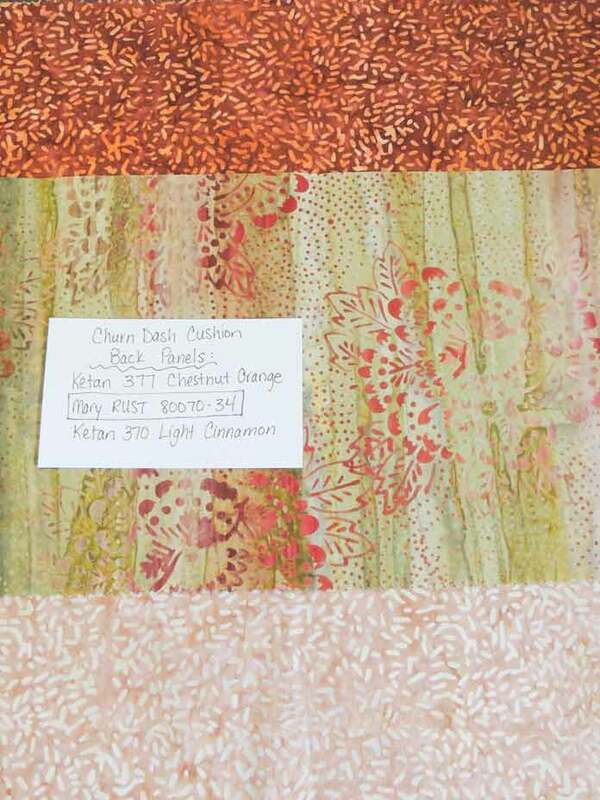 Then use the Ketan batik Light Cinnamon (81000-370) cutting it into 2 – 2″ strips. Subcut one into 2 – 9½” strips and one into a 20″ strip. Sew one of the 9½” strips to the right side of the top left churn dash block; press the seam to the strip. Sew the top right churn dash to the other side of the strip, pressing the seam to the strip. Repeat with the bottom two churns and the remaining 9½” strip. Sew the 20″ to the bottom edge of the top row; press the seam to the strip. Sew the top edge of the bottom row to the strip, pressing the seam again to the strip. See the photo below. The cushion top should measure 20″ square. Layer the cushion front backing fat quarter Right Side Down on a flat pinning surface. Place the batting on top. Place the assembled cushion top on top Right Side UP. Pin the layers together or use your preferred basting method. Use a contrasting thread to quilt. I quilted ¼” away from the Fabric B/D churn dashes and in the ditch of the Fabric A/C churns. I also quilted in the ditch of the sashing. 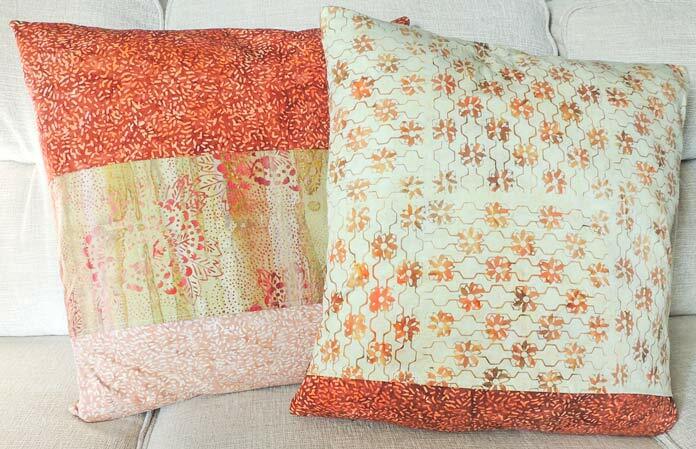 Trim the quilted pillow front to 20″ square remembering to keep a ¼” of fabric past the churn dash points. The top back panel is made up of leftovers from Fabric F and coordinating Ketan batik Chestnut Orange. Sew them together to make a panel 20″ wide x 15½” high. Be sure to zigzag the seam between the fabrics. The bottom panel is made from the coordinating Ketan batik (81000-370) used for the sashing cut 20″ wide x 8½” high. press ¼” of fabric over to the wrong side and then another ¼” and sew using thread that blends in with the fabric colors. Line up the back bottom panel, RIGHT SIDE DOWN, with the non-hemmed edge lined up with the bottom edge of the cushion cover front: the hemmed edge will lay over top of the top back panel hemmed edge. Back panels of both quilted batik cushion covers. Two quilted cushion covers done! Turn this second one out, pushing the corners out with a fingertip and insert a pillow. The backs of the cushions look great together thanks to the coordinating Ketan batiks and the prints in the Rust colorway of Mary. Front sides of the two batik quilted cushion covers. I really love that you use the traditional names for these quilt blocks. So many peeople rename them based on the colors they choose or the fabrics tht the traditional names are being lost. Not to mention that most of my students don’t know what a churcn dash is, but most of us don’t churcn our own butter either. Thanks Debbie! The churn dash block was the block I used in my first internet block swap in 1998! 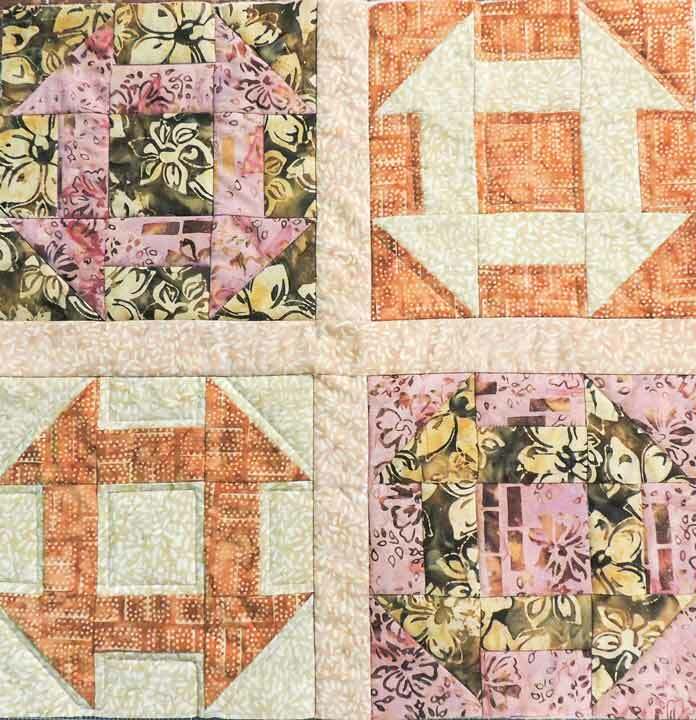 Traditional blocks have lots to offer modern quilters and batik fabrics show them off beautifully.